one band that does it all! Marley’s Ghost returns to the Freight for a celebration of musical possibilities, from country to reggae, English folk to gospel, rhythm and blues to Scottish bagpipe tunes. In the words of the LA Weekly, “This West Coast band deftly, and frequently daffily, dashes across decades of American music to create a sound that’s steeped in tradition but never bogged down by traditionalism.” As band member Dan Wheetman says, “Instead of having to be in a Delta blues band, an a cappella singing group, a country band, a reggae band, and being a singer-songwriter, I’m in one band and we just do all that. It’s very convenient.” What comes through at a performance of Marley’s Ghost is that these guys have fun, and they make the experience big fun for the audience too! 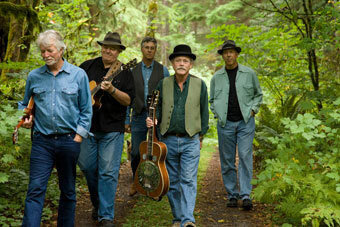 The group features the aforementioned Dan on guitar, fiddle, bass, banjo, and blues harp, Jon Wilcox on mandolin, guitar, and bouzouki, Mike Phelan on guitars, dobro, fiddle, bass, and lap steel, Jerry Fletcher on percussion and keyboards, and Ed Littlefield on guitars, dobro, pedal steel guitar, and Highland bagpipes. Oh, and they all sing! “We're five singers who don't think genres mean much,” Mike says. “If you connect with the song and the song connects with you, that's what’s important, and that’s a real core belief of the band. When I go to a performance, I want to hear passion. I want to hear somebody up there doing it because they can’t not do it. That’s what we’re going for with everything we tackle.” Their tenth and latest album, Jubilee, features mostly American roots music by such artists as Kris Kristofferson, John Prine, Bobby Womack, Levon Helm, Butch Hancock, Tom Russell, and Paul Siebel. The website Pop Matters calls the album “admirable” and “a joyous record that more than earns its name. There’s a sincere sense of celebration in these songs.” Come on out and join the celebration with Marley’s Ghost! Sam Baker is a man of few words. He was traveling on a train in Peru in 1986 when a bomb planted by the Shining Path killed seven of his fellow passengers and left him with a long, hard road back to reasonable health. “Life is a gift,” he says. “I went through a lot of bitterness. A lot of anger. But those things are toxic. Gratitude for what remains is more helpful than resentment for what was lost. Ultimately, I came to understand that these days are wicked short and terribly beautiful. All I’ve got – no matter what I hold in my hands, drive around in, or put in the bank – all I’ve got is this one breath, and if I’m lucky, I get another.” His brand new album, say grace, follows mercy, released in 2004, pretty world, released in 2007, and cotton, released in 2009.